Ah yes… there it is… “This science fiction stuff”… Always love it when SF is put down like that. The genre is still seen by many as kiddie literature, cheesy tales of rockets, robots and raging hormones to be read by teenage boys when they’re waiting for the next episode of Doctor Who to come on or the new Star Wars film to be released. Try to tell some people that SF is every bit as “serious” or “respectable” as other genres, that its stories are every bit as deep and complicated as those written by ‘proper’ writers and you get either a tolerant eye roll or a dismissive laugh. In 2017 it’s still not easy being a SF fan sometimes. At this time of year I dread the phone ringing, worried it might be someone asking me for a tip on a good book to buy for someone. It’s gotten so bad that if I hear a scammer on the other end of the line, telling me they’re ringing from Microsoft to let me know there’s something wrong with my computer I’m actually relieved. But it’s happening already. Twice in the past week I’ve been asked The Question, so I thought I’d share my recommendations with you. My Festive Five are a mix of classics and new titles – well, reasonably new. I chose them not for any highbrow reasons – they’re not ‘representative of the genre’, they don’t ‘illustrate key concepts’ or ‘highlight the beauty of the universe”. They’re just cracking good stories, and any one of them will provide a new or seasoned SF fan with many hours of reading pleasure. I make no apology for the fact that three of the five are books set on Mars. I’m a Mars nut, it’s been my favourite planet since I came across a 1977 copy of National Geographic magazine in an art class at school in the early 1980s and I fell head over heels in love with it. I still have that magazine today – yes, the same one, I’ll admit I… “borrowed” it and never got around to taking it back – and it sits on my groaning bookshelves alongside around fifty other books about the Red Planet. But those three fiction titles are my favourites, and I can recommend them to others confident that they’ll find at least one of them as inspiring and exciting as I did. Ok, so, first, THE MARTIAN by Andy Weir. THE MARTIAN is now probably best known as a mega-budget mega-successful Ripley Scott film starring Matt Damon, and many of you will know that, like many films, it was a hugely successful book before it exploded onto the big screen. What many people don’t know is that started off as an ebook, free to download, written as a labour of love by its author Andy Weir. It had a huge and passionate following online, and I remember reading it on one of my first smartphones, and was entranced by it from the start. 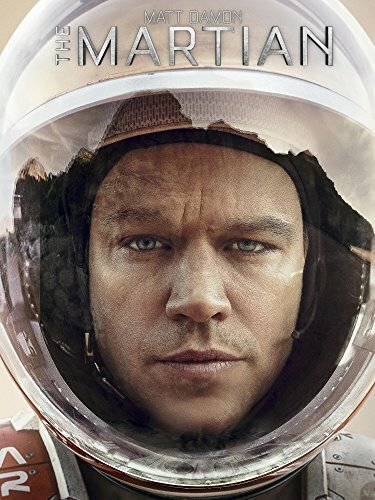 Essentially a modern take on the Robinson Crusoe story, without the native companion, THE MARTIAN tells the tale of an astronaut stranded alone on Mars after the rest of his crew are forced to abandon their mission, and him, when a huge storm hits their base. In order to survive until he can be rescued, the astronaut has to find a way to grow his own food. Luckily, he’s a botanist so is able to transform a small bag of potatoes into a life-sustaining crop. How he does that is what sets THE MARTIAN aside from many science fiction books, in that it is very heavy on the science rather than the fiction. Author Andy Weir goes to great lengths to describe just how the astronaut is able to turn his Mars module into a greenhouse and use it to grow crops, and then how he is able to use pieces of old kit on the planet to contact Earth and let them know he is still alive. It’s as much a story about the brilliance of engineers and scientists as it is about astronauts. How Whatney cannibalises old Mars probes for parts, keeps his rover warm during his epic drive across Mars and then escapes the Red Planet are all described in painstaking detail in the book, while they’re pretty much skipped over in the film. Some parts of the story aren’t scientifically accurate. Andy Weir admits quite freely that the ferocity of the storm that forces the crew to abandon Mars, and their friend, is simply impossible (why? Well, Mars’ atmosphere is very thin, far too thin to create howling, sandblasting winds as strong as the ones that put the crew in such peril), but speaking as a science-literate type I can honestly say “Who cares? !” It’s a novel, a work of fiction, not a reference book. I’m quite happy to take off my science head and just be entertained by a rollicking good story if it’s told well, and THE MARTIAN is told very well. So I forgive Andy his silly storm. If you’ve seen the film then you’ll know that the stranded astronaut has a hard time on Mars, and that he suffers various setbacks before being rescued. Well, in the book he has a MUCH harder time. Mars tries everything it can to kill him, and almost succeeds. In fact, reading the book is such a relentlessly heart-in-mouth rollercoaster ride that you turn the last page quite exhausted. But when you do turn that last page you have such a silly, happy grin on your face that you look like The Joker. Trust me. This is a “a handful of people survive the end of the world” story, and I know exactly what you’re thinking: oh god, not another one. Yes, another one. But this one is very different. Part two of SEVEN EVES – the “after” part – takes the reader far, far into the future, to see what happened after the sterilisation of Earth. As the descendants of the survivors begin to repopulate the planet there are shocks and surprises, triumphs and tragedies, laughter and tears. It will make a fantastic film (it’s already in development, I believe). I’ll be honest, I found the first half of the book much more interesting and memorable than the second. 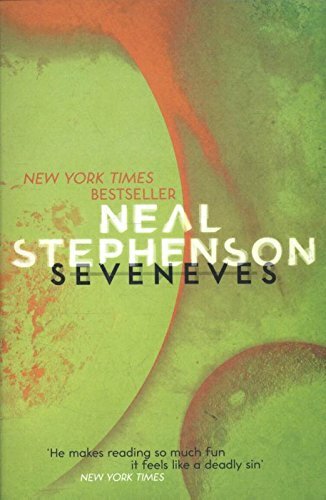 In fact, after buying SEVEN EVES I’ve re-read it three times and twice I’ve actually stopped halfway, more than satisfied by having the story end there. But I know other people absolutely love the second part, and the book as a whole, so that’s my issue! Back to Mars for our third book, and I need to place my cards on the table here and admit that when I first read RED MARS, by Kim Stanley Robinson, it changed my life. That’s a very bold and clichéd claim, I know, but it’s true: RED MARS was the first novel set on Mars that brought the planet to life for me, that wrote about it and portrayed it accurately and lovingly, that actually made it seem like a real place. The Mars in KSR’s book – the first volume in a trilogy, the other titles being “Green Mars” and “Blue Mars” – is NASA’s Mars, the real Mars, i.e a lifeless, rocky, frozen desert. There are no aliens on this Mars. The “First Hundred” astronauts who travel to Mars to establish the first colony there find none of the canals or elegant cities from Ray Bradbury’s “Martian Chronicles”, nor do they come up against any of the insectoid warriors or half-naked beautiful princesses from Edgar Rice Burroughs’ John Carter novels. Their Mars is a wasteland – albeit a stunningly beautiful one – covered in dust, rocks and boulders, a genuine frontier they have to conquer in order to survive and go on to build a new civilisation. Of course, building a civilisation takes time… a lot of time… and human beings don’t live very long. How the astronauts manage to survive long enough to at least hear the birthing cries of that new civilisation it is handled very cleverly, using science not sorcery, and as the book progresses the reader learns a lot about the science of “terraforming”, transforming a lifeless world into a world capable of sustaining life. Hence the titles of the books in the trilogy: Mars starts off as a dead, red world (“Red Mars”), slowly becomes capable of supporting plant life “(Green Mars”) and eventually becomes a truly Earth-like world with a breathable atmosphere, lakes and even oceans (“Blue Mars”). RED MARS is clearly not your average science fiction novel. It is the story of how a new civilisation is sculpted on Mars, so as well as the required science and engineering there is a lot of politics, economics and philosophy too. Refreshingly, the astronauts who land on Mars are not the clichéd, square-jawed, Dan Dare types found in other books. They are flawed human beings, each with their own friends and enemies, agendas and secrets, dreams and nightmares. There are heroes and villains aplenty. Some of them are people you’d really treasure as friends in real life, others are people you’d avoid as much as possible, others are people you’d hate to have in your life. 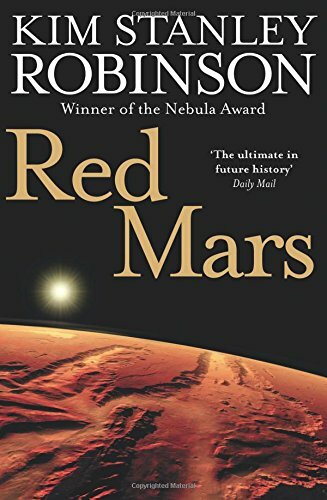 I would carefully but respectfully suggest that RED MARS is probably not a book that would appeal to the same people who enjoyed THE MARTIAN. It’s a much deeper, much broader, much more complicated story, with so many levels, characters and plots that it has so far proved impossible to film because it’s just too complicated and intellectual a story for fluffy Hollywood. In fact, as a devoted fan of the book – and I read it every year, just to top myself up on how it makes me feel about Mars – I am torn between wanting desperately to see it up there on the big screen, to see my beloved characters brought to life, and dreading someone trying to film it and ruining it. At some point someone will, and the studio will no doubt market it as a “science fiction Lord Of The Rings”, and then we’ll see what happens. In the meantime, if you want to lose yourself in a genuinely epic human story that just happens to take place on a faraway planet the colour of rust, then RED MARS will serve you well. You might find it too dry and too “serious” for you, and give up halfway. Or you might fall into it and fall in love with it like I did, and will never see, read or hear the word “Mars” again without being drawn back into its story. Next I have a story for you that is a good old fashioned fantastic tale of sleek silver spaceships, evil, sneering aliens and brave, star-hopping astronauts. Ok, maybe not that old fashioned then. STARTIDE RISING by David Brin is one of several novels in his popular and best-selling “Uplift” series, set in a future when mankind has finally made contact with aliens, lots of them. Now, although usually that doesn’t go well , and our new neighbours turn out to be bad ‘uns, resulting in a War of the Worlds, sometimes such a scenario is a joyous affair. We meet aliens, get on with them, learn from them, are greeted as equals, go around theirs for a lovely dinner, chat long into the night whilst sipping Baileys and everything is lovely. That’s not the world of David Brin’s “Uplift” stories. In his future when we meet aliens we have a very rude awakening indeed. While some are friendly, others look upon us almost as savages, little better than animals and not worthy of any respect or help. Obviously that’s a shock, after centuries of looking forward to being welcomed into a Galactic Club where we would be just as important as everyone and everything else. In Brin’s fascinating “Uplift” universe, aliens have spent millennia artificially enhancing the intelligence and capabilities of less developed species, “uplifting” them to sentience. They don’t do this out of the goodness of their hearts, but to provide themselves with servants who have to work off their debt before going it alone in the universe. It’s kind of a tradition, the way of things: every alien species was uplifted at some point in its past, so they uplift others in turn. The fact that humanity wasn’t uplifted by another race but evolved to reach space independently makes us inferior, dirty even, in the eyes of the “eatees”, and leads to all sorts of problems. As luck would have it, without even knowing it had an official name, we have already been “uplifting” other species long before making contact with aliens, and STARTIDE RISING is the story of the first starship crewed by dolphins. Yes, dolphins. These aren’t your average ball-balancing Seaworld dolphins though. The dolphin crew of the “Streaker” recite dolphin poetry (much of it very rude), have great friendships with their human companions, and are every bit as intelligent, conflicted and troubled as we are. In STARTIDE RISING, after making an amazing discovery out in deep space, which reveals a secret which could change everything, the Streaker, being hotly pursued by fleets of alien ships who want the secret for themselves, crashes on an alien moon and its crew has to go into hiding. STARTIDE RISING has it all – love and betrayal, boo-hiss alien baddies … and a brave dolphin starship captain every bit as noble and heroic as that most famous of all human starship captains, James T Kirk. …and finally, yes, another Mars book. We all love a good “What if..?” story, don’t we? And VOYAGE, by Stephen Baxter, is one of the best science fiction What If stories there is. Unlike many novels in this sub-genre of science fiction VOYAGE doesn’t rely on time travel to present the reader with an alternative future. There’s no whirling time machine in VOYAGE (although Stephen Baxter wrote “The Time Ships”, the officially approved sequel to HG Wells iconic novel “The Time Machine”), no TARDIS materialising with a wheezing groan of millennia-old engines. In VOYAGE Baxter just asks a simple but intriguing question – what would have happened if Kennedy has survived his assassination? How would the world have been different? And the answer – NASA didn’t stop once they’d landed on the Moon. They kept going. 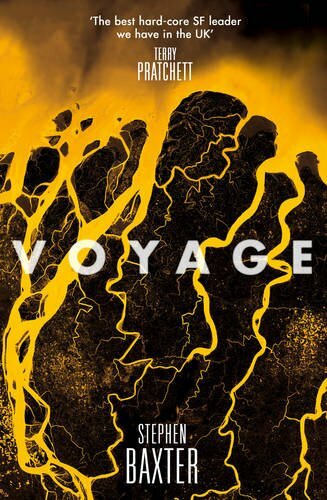 VOYAGE is the exciting story of what might have happened if NASA had kept the momentum of the Apollo missions going and sent a crewed mission to Mars, instead of turning its back on deep space exploration and built the shuttle and International Space Station instead. VOYAGE is about as far from the politically-correct, science-can-solve-everything world of RED MARS as it’s possible to get. In VOYAGE’s 1970s and 1980s sexism is part of everyday life, politicians are slimy and scheming, money is still worshipped. Its heroes have more rough edges than a broken window, its heroine has more baggage than a Heathrow carousel. It’s no spoiler to say that the book ends with a successful landing on Mars – that’s the whole point – but the crew’s journey to that point is hard, very hard, and pushes each and everyone of them to breaking point. And as much as I love RED MARS and its realistic portrayal of my favourite planet, the final chapter of VOYAGE, with its beautiful description of the first footsteps taken on the Red Planet, and the emotions experienced by the person taking them, still reduces me to a blubbering wreck every time I read it. So, there you have it, a very small selection of science fiction books to look for on the shelves if you’re wondering what on Earth – or Mars - to give one of your starry-eyed book-loving friends or family as a Christmas gift. Some are more technical and darker than others, but each one is a rollicking good story that will keep the lucky recipient engrossed and entertained through the holidays.